Oxygen indicators reveal the presence or absence of oxygen by changing color. When the pink colored indicator is first removed from its protective packaging and exposed to an oxygen rich environment it will turn blue in color within a few minutes. After placing it within a sealed treatment bag with the proper amount of Ageless, the oxygen indicator will gradually return to its pink color over a period of 2-5 hours or when the oxygen content of the treatment bag reaches less than 0.01%. Reuse of the oxygen indicators is not recommended and do not purchase more indicators than you can use in a 6-12 month period. It's also recommended that you store the eyes in a cool dark place such as a refrigerator. 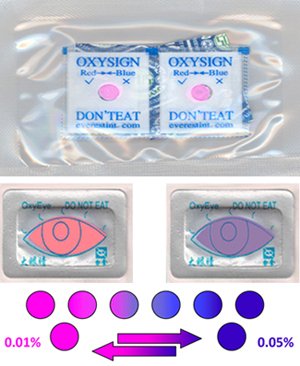 Oxygen Indicator Tablets are a small pink tablet (about the size of an aspirin) packaged in its own plastic wrapper (do not remove the tablet from its wrapping). There is a small pin hole in the plastic wrapper to allow oxygen into the tablets through the protective wrapper. Simply open the outer plastic bag which contains the two smaller wrapped oxygen indicator tablets along with a small ageless pack, and place both tablets into your treatment bag along with the proper amount of Ageless. The tablets are sold by the packet with each packet containing 2) tablets. Oxygen Indicator Eyes are packaged in a clear vacuum sealed packet containing 10 indicator eyes on a strip of thin plastic. The reactive material used in the eyes is the same as that used for the tablets, only in powder form. The powder form produces more reactive surface area as compared to the tablets and is therefore faster responding. Each eye measures approximately 1-3/8" long by 3/4" wide and has a self-adhesive backing for mounting them within a treatment bag. After you have removed the amount of eyes needed, simply reseal the remaining eyes in their original package which contains a 10cc oxygen absorber. The eyes are sold by the packet with each packet containing 10) eyes.